Is Hitler bigger than Napoleon? Washington bigger than Lincoln? Picasso bigger than Einstein? Quantitative analysts are rapidly finding homes in social and cultural domains, from finance to politics. What about history? 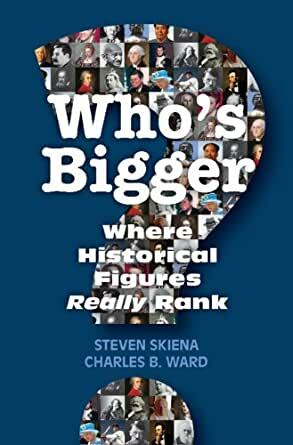 In this fascinating book, Steve Skiena and Charles Ward bring quantitative analysis to bear on ranking and comparing historical reputations. They evaluate each person by aggregating the traces of millions of opinions, just as Google ranks webpages. The book includes a technical discussion for readers interested in the details of the methods, but no mathematical or computational background is necessary to understand the rankings or conclusions. The authors present the rankings of more than one thousand of history's most significant people in science, politics, entertainment, and all areas of human endeavor. Anyone interested in history or biography can see where their favorite figures place in the grand scheme of things. While revisiting old historical friends and making new ones, you will come to understand the forces that shape historical recognition in a whole new light. 4.0 out of 5 starsFascinating! Recommended. This is a fascinating book with an extremely interesting concept. The authors use the incredible power of the internet, Wikipedia, and Google's Ngrams to create a mathematical rating system (significance) for people, both current and historical. They then use these data to compare people in many areas, professions, and times. They explain their processes and calculation very well and then provide comparisons with "experts" and "Top 100" lists, etc. to validate that what they measure is actually doing the job. Then they delve into literally scores of categories to compare the most significant figures. Was Thomas Edison more significant than Alexander Graham Bell or Eli Whitney? Who was the most significant world leader between the world wars? Which King or Pope had the most long-term significance? They do admit that the data in Anglo-centric, all of the data is in English, and they have made a correction for recency. All in all it is fascinating to wander through their tables and graphs and see where my personal favorites fell. One criticism I have is that there is really too much data and too many categories and too many comparisons. It would have been better to focus in more depth on fewer categories and dive deeper into the data, leaving the more esoteric areas to another volume or to the internet (they have a very nice companion website). For everyone interested in history and interested in numerical comparisons (for any area - baseball, business, the arts, etc.) the book is highly recommended. This book opens a most fascinating new perspective on history. At first dubious as to the premise of this book, I was nonetheless compelled by its depth. Viewing history is not a mathematical pursuit, yet I find it very difficult to argue against in depth statistical insight such as that presented here. 1.0 out of 5 starsInternet traffic? Really??? My daughter's honor's World History teacher gave them this list today. Each of them has to choose a different person to study for the next 2 months. Did you consider most of Grover Cleveland's traffic might be elementary school children doing research on their assigned president for the year? How else does he get on this list? In what universe is Woodrow Wilson more influential than Martin Luther King Jr? Do you think Joseph Smith might be there, because people think polygamy in Mormonism was weird? Woodrow Wilson is only there, because he's the president that had finally had enough of their shenanigans. But how does a polygamy issue in ONE state in ONE country get a person on a list of the 100 most significant historical figures in history? Did you consider why these individuals in particular are being googled? When you've read books and watched multiple documentaries about an individual, you're probably not going to search that person up on Wikipedia. Why would you? You look up the people you're either mildly curious about or have to do research on for an assignment. So in fact, a hit on Wikipedia could indicate a person didn't warrant enough significance for deeper study. I have rarely looked up the people I consider the most influential on the internet, because I've already studied them in depth. Apparently I should be more careful, lest the not-historian programmers interpret my late night clicking as significant. I guess only 6 of them will be researching women or someone who isn't white. 3.0 out of 5 starsVery interesting study -- but did the authors bite off more than they could chew? This book was reported on recently by Time Magazine (their piece titled "The 100 Most Significant Figures in History"), and the premise of the work is quite interesting. This is not a study based upon some survey or collective opinion from a group of historians or academicians, as one would normally expect. Rather, it reports on the work done by two computer scientists -- Steven S. Skiena, Distinguished Teaching Professor of Computer Science at Stony Brook University, and Charles B. Ward, engineer on the search engine team at Google. "When we set out to rank the significance of historical figures, we decided to not approach the project the way historians might, through a principled assessment of their individual achievements. Instead, we evaluated each person by aggregating millions of traces of opinions into a computational data-centric analysis. We ranked historical figures just as Google ranks web pages, by integrating a diverse set of measurements about their reputation into a single consensus value." "Historically significant figures leave statistical evidence of their presence behind, if one knows where to look for it, and we used several data sources to fuel our ranking algorithms, including Wikipedia, scanned books and Google n-grams"
"...we adjusted for the fact that today's stars will fade from living memory over the next several generations... By analyzing traces left in millions of scanned books, we can measure just how fast this decay occurs, and correct for it..."
"Since we analyzed the English Wikipedia, we admittedly measured the interests and judgments of primarily the Western, English-speaking community... Our algorithms also don't include many women at the very top... This is at least partially due to women being underrepresented in Wikipedia". The authors then dissect the study results and examine how individuals in many different fields and pursuits were ranked - Part II of the book examines American political figures, modern world leaders, individuals in science and technology, religion and philosophy, sports and the arts. And here is where I almost immediately found an error, leaving some doubt in my mind regarding the rigor and accuracy of the work the authors have presented. In Chapter 14, the authors present a tabulation of the "most significant classical composers", stating that "19 rank among the most 500 significant figures in history". Except -- they have overlooked two composers at least - from the top 100, Richard Wagner is at #62 on the list and Pyotr Il'yich Tchaikovsky is at #63. If the full listing of 500 was examined then how many more composers may have also been omitted? And I haven't examined any of the other tabulations to determine whether or not other omissions may have been made in those specific listings. This is unfortunate. The study is fascinating and perhaps ground-breaking. But the authors need to step back and carefully examine the conclusions that they are presenting. If this reviewer has been able to catch a fairly obvious error so quickly, then it suggests that others may be present as well. Once these are fixed, the book will be fully deserving of 5 stars.